I am working on a Gottlieb Genesis. My ramp flashers were not working. I noticed that the jumper wires between Q55 & Q56 were cut. I ended up replacing both transistors and installed new zero ohm resistors. This fixed the non working ramp flashers on both sides. After the ramp flashers began working again I played a quick game and noticed towards the end of the game that the ball release under the apron was firing repeatedly. I turned the machine off and then back on. I started a new game and this time when a ramp shot was triggered the flashers would flash and the ball release would fire with each flash of the ramp flashers. When in test mode, the ball release fires like it should at L14 but it also fires at Solenoid #4(Left ramp flashers) & at #7(Right ramp flashers). I have now lost flashers again on both sides. Any help would be greatly appreciated. -Ball release triggers at L14 and at solenoids 4 & 7 during test mode. -Briefly grounding Q55(left ramp flashers) triggers ball release. -Briefly grounding Q56(right ramp flashers) triggers ball release. -Ball release triggers at L14 but nothing at solenoids 4 & 7. Note: This particular driver board had Q56 removed at some point so cant test right side flashers. Game the driver board is from does not use it. When the machine is powered up with the known good driver board, the reveal motor completes one revolution(I am told this is normal?) and a ball is kicked out into the shooter lane. I also noticed that while the motor is running, the ball release is energized. However its almost as if it doesnt have full power as I can manually push on the plunger and it releases. I can feel that it has power though while the motor is spinning. If I manually push it in a ways, the plunger will energize all the way in and hold. None of this happens with the original genesis driver board. OK, I see a possible issue that cause this strange behaviour on your Genesis. 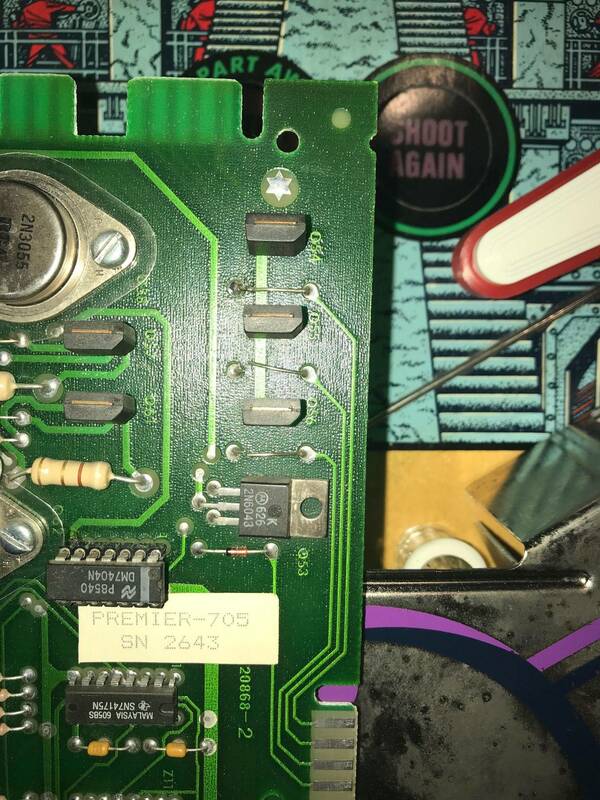 The common point with the ball release and flashers is that all uses "playfield transistors" (2N5879 mounted on metalic plate). They are all mounted on the right side of the playfield, the Q3 for ball release is at bottom (near the outhole) and the Q1 & Q2 are at top. 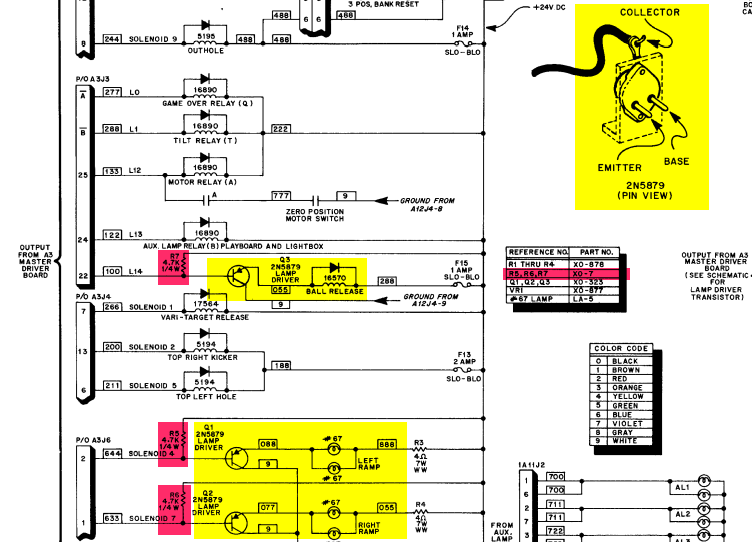 As you can see on the schematics, there is also 3 resistors that polarized the base of the 2N5879s. 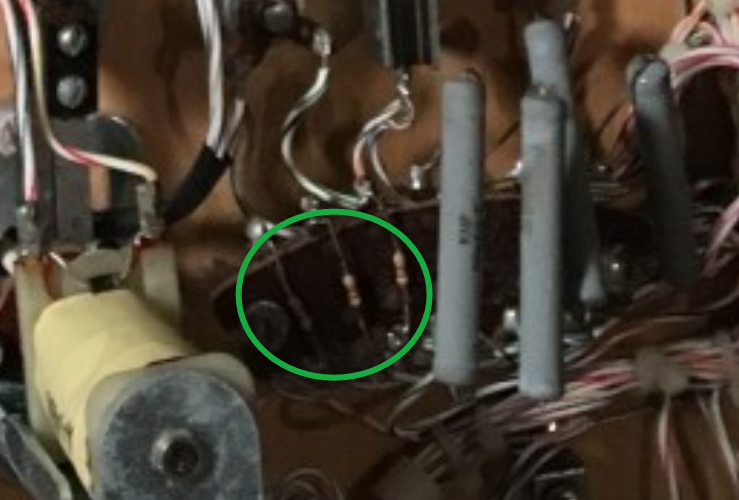 As far as I remind, the three resistors are mounted on a plate under the playfield (they are small, 4.7 K 1/4 W). One pin of the resistors tied the base of each transistor, and the others pins are commonly connected to +24v. But... if the +24v is not connected (cutted wire ? ), the behaviour can be very strange. Because the 2N5879 are no more polarized, and may have spurious switches. The most fun effect, it that, as the resistors are connected together, the command of one may affect other ! If the "-" is applied on L14, it can cross the resistors and drive the Q1/Q2 (as resistors are crossed in series, it's equivalent to 2 x 4,7 K =~10 K) !!! I'm quite sure that the 24 volts is no more connected on the resistors plate. Verify the resistors plate with ohmmeter, the common point of the three resistor should be connected to the +24 v line. Thank you! One of the jumpers between the resistors had broken right at the solder tab. I did not see it at first but found it with the meter. Flashers are now working again! The Genesis is good, but it's even better with a "Freeplay" ... if necessary, see on our site: https://www.flipprojets.fr/Proms80B_EN.php ! Binaries for EPROM are available for free.